It's easy to know why you pick an inexpensive ethnic place-- because the food is noticeably better than its peers serving much the same thing, because the place tries harder than the average storefront, because you like the people and want to encourage traffic. But you expect outstanding food and dedication from an upscale place-- and yet we don't feel the need to bestow our little plaque on every such place. (Somehow, Everest seems to be surviving anyway.) Last time out, we gave one to Frontera/Topolobampo (for having been a pioneer in bridging the worlds of Chicago's haute and ethnic cuisine, to my mind) and to Moto (justified because Chef Cantu had engaged our community, and our intellects, so fully; the "neighborhood" in Moto's case may have been the virtual one more than its actual location). So far at least, the only nominee approaching that price range is Sweets and Savories; what would we find there, assuming we even liked the food and service in the first place, that would justify picking this one over Butter, Scylla, Green Zebra, Avec, Rodan, Despair, Ennui, Precocious, Marsupial, or any of the other new, hot, hip, see-and-be-seen joints to have opened this minute? Sweets and Savories is, first off, saddled with the name of a muffin shop, when the interior, dark and simply appointed with posters for French chocolates, calls for a stark one-word name like the ones above. Service when we were greeted (and the restaurant was still pretty empty) was effusively friendly, jovial even, and upon seeing GWiv suffering from a cold, our host thrust upon him a warmed Sambuca to work its magical effects on his sinuses. 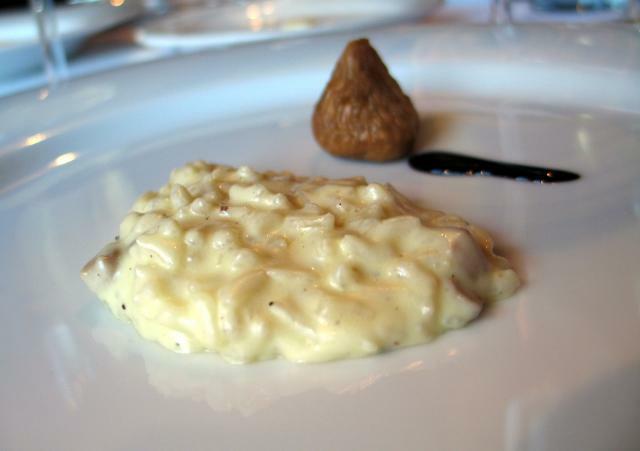 GWiv was also offered, in what must be the first example of huffing I've ever seen in a fine restaurant (not counting snorting from the whipped cream cans at Farrell's Ice Cream), a whiff of the bag the white truffle mentioned in previous posts had come in. Alas, it turned out that the truffle had been used up the night before. The first entree course was a huge scallop on a celery root puree, with a veal sauce (variously described as either being, or not being, the Perigord sauce mentioned elsewhere), a much more robust sauce than the kind of citrusy topping you usually get on scallops. If there was a flaw to the meal it was that it peaked with the first two courses; this was excellent and I think all of us agreed at the end that it was the best thing of the night. Next was a "five mushroom" soup, dotted with marsala. Rich flavor but salty. Then came salmon with an unconvincing toupee. No, that's oxtail, I think, or something like that, on a beet risotto (beetotto?) and with a horseradish inflected sauce around it. This one was better in parts than as a whole, partly because, sad to say, it's just hard to get excited about salmon any more. It really is the chicken of the sea. Maybe if it had been done to a crisper crust-- on both the salmon and the scallop, I might have cranked the stove higher and gone for more burn outside and rare inside, they were sort of done evenly to the (to my mind, not necessarily everyone's) less interesting midpoint. The beets were quite good, so was the braised whatever the meat was, and the horseradishy taste of the sauce served them well. 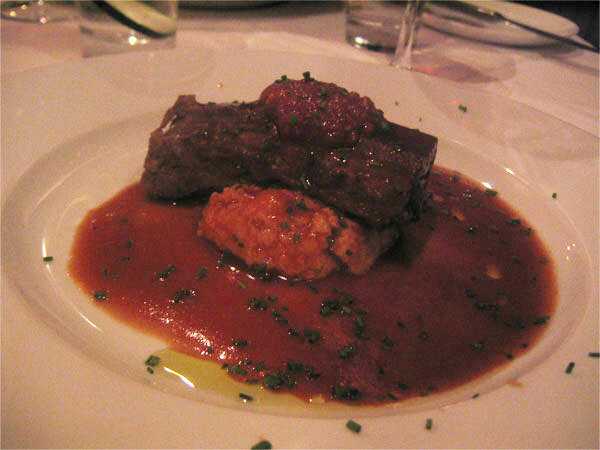 Next, a very tender shortrib (sans bone) on polenta. Sauce was a little sweet/cloyingish for me-- it reminded me of the glazed meat at a central European restaurant-- but the place is named Sweets and Savories for a reason and this was an estimable dish. Incidentally, when we saw one of the foie gras-topped wagyu burgers go by, we tried to add that to our meal-- which as you can see was much too small-- just for tasting's sake; but it turned out they were out. The night to come for that, clearly, is Wednesday, when it's on special. For a palate cleanser, the world's smallest salad! Oh wait, did I say finally? There were chocolate truffles at the end, too. In the meantime, between our picture-taking and the fact that we seemed to be talking about the food so analytically, it was obvious that the staff was wondering about us and even asked, at one point, if we were food critics. (What is the accurate answer to that question, I wonder?) Anyway, shortly after, our evident curiosity got us invited back to see the kitchen and meet the chef. Hey, we didn't get that! The legendary Old-Fashioned Donuts apple fritter, seen on the LTHForum calendar. G Wiv was his modest, self-effacing self, effaced, so I had to explain that here was the man who had taken the picture which had, so to speak, put the Old-Fashioned Donut apple fritter on the map of Chicago eats. So, very friendly and well-run place, totally 'tude-free, great value when you consider all that we had for $60, not in the top tier of Chicago restaurants but unquestionably the kind of mid-level place you'd be very happy opened near you, maybe even the folks who mob Rose Angelis a few blocks away out of proportion to its quality will discover it eventually... is this what makes a GNR award? Shouldn't there be some particular quirk that makes it stand out even further from the pack of one-word-named places to open this month, Crouton, Spore, Alabaster, Orgone? Well, 80% of life is showing up, as Woody Allen said. Sweets and Savories got nominated, it was tried, it was liked. Good enough for me. Well put. It was an enjoyable meal at a neighborhood spot with some pretensions, and the ability to execute a lot of them pretty well. My quibbles with the meal, and perhaps Mike's as well, were mostly that certain dishes were not to my taste (with the sole exception of the oversalted mushroom soup, which was quite edible and could have been wonderful, but was clearly oversalted that night), not that they were not well-conceived or well executed. And, of the courses, almost all were pretty darned tasty. The chef's explanation of the name was a story of the genesis of the place, which was both interesting and perhaps indicative of his approach to things. A little over a year ago, the ownership was negotiating to secure a space for a restaurant, and it fell through. But he wanted to do something now, and saw this space on Fullerton. So he opened a mostly dessert place (Sweets) with a few snack dishes (Savories), most notably the Foie Gras Burger. The expectation was that people would stop in for a dessert or a snack, but people began coming in for both, and then clamoring for more savory options. So the menu expanded, and a little dessert and snack place has become a nice neighborhood place serving fairly fancy food at a good price. And it is still evolving. Who knows what it will turn into in another year? Likeable folks, good food, good value. Did I mention a reasonably priced wine list, and a $10 corkage fee? They also had a nice Calvados for the Bride at meal's end, and I spied a large selection of Todd & Holland teas in the kitchen - all good signs for me. Dave's a really sweet guy. I assisted him at a demo this summer at the Botanic Garden, and he was by far one of the nicest, most unpretentious, and truly fun people we worked with all season; it was neat to see how many of the S&S regulars trekked all the way up to Glencoe to see him, and to watch him interact with little kids, cranky old folks, snooty North Shore matrons, and we volunteers with unforced grace and humor. I wish him all the success in the world, and IMO, S&S would be an excellent - and appropriate - choice for a Great Neighborhood Restaurant. Hope he graces the BotGar with his cheery presence next season, too. Glad to see you guys enjoyed. I probably enjoyed that mushrom soup more than most because I generally enjoy salty foods. One other point...I wouldn't be so dismissive of some of the "one name" place you mentioned in the OP. Avec, in particular, turns out outstanding food and will probably be around for the long haul. I think that this restaurant should totally get a GNR award. If I'm reading correctly, some questioned whether this place fit into what the program is intended for. First, I love this place because it is one of the few places with high quality food without the high brow snobbery to go with it. Second, unlike some of the other restaurants mentioned, you never leave feeling robbed in terms of the value of your culinary experience relative to your hard earned bucks. Lastly, I like this place so much, I'll use any influence I have to make sure it's successful and can remain on my short list of favorite places. I really admire this place because they work very hard to please their customers and try and do the right things versus other places that seem more gimmicky where the passion isn't apparent and you're reminded of how underwhelmed you are by the whole experience when it's time to pay. Absolutely agree with you and Dickson, great service from the moment, literally, we walked in the door, very nice dinner, and a good value for the money. I was also appreciative of Sweets & Savories attention to detail, slice of cucumber in the water, which was surprisingly refreshing, timely changes of sliver, the occasional question from the waitstaff that showed professionalism, as opposed to rote learned in a corporate manual. Thanks to jesteinf for nominating Sweets & Savories for a GNR, it likely would have stayed off my radar otherwise. 2) Citrus marinated salmon on a bed of black-eyed peas - salmon was *perfectly* done - nice seared crust with a real orange zing, completely tender and rare on the inside. I thought the black-eyed peas were a bit too crunchy, but maybe they are supposed to be that way? 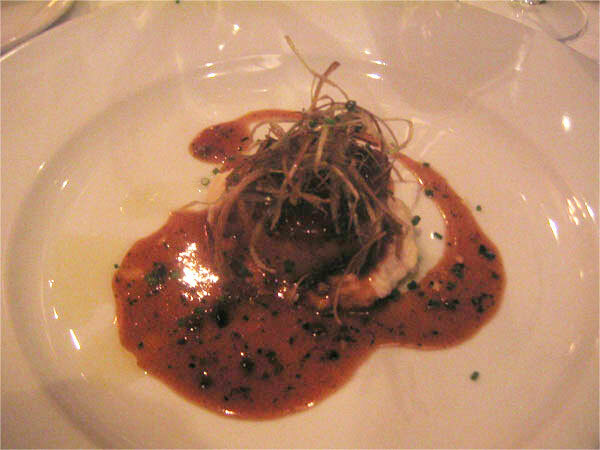 3) Quail stuffed with foie gras with mashed potatoes and perigord (?) sauce. My favorite of the savories... words elude me! This was an interesting dish. The chutney was very sweet, and the grits were very savory and rich. I heard them described to another table as goat cheese grits. It must have been a mild goat cheese, since I would not have identified the grits on my own. 7) Raspberry ice cream float - raspberry, ice cream, pelligrino - very refreshing. 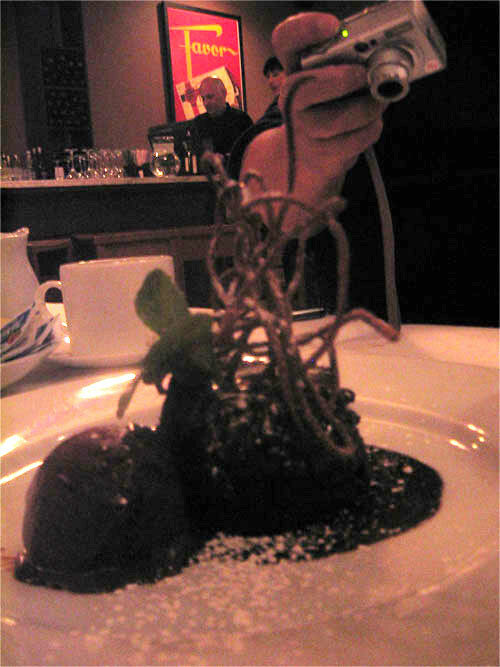 Chocolate cake with chocolate ice cream and chocolate sauce - I love chocolate, but this dessert was over the top. It needed something besides chocolate - perhaps a fruit-based sauce? Or, maybe a mix of dark and milk chocolates instead of all the same "shade." grand marnier truffles - amazing. Overall, the food was delicious. My problem was with the service. First and foremost, I felt extremely rushed. We had barely finished one course when the next was brought. And they actually brought the raspberry float before I had finished my sorbet. A big no-no in my book. My fiance was a little annoyed that they didn't ask us if we wanted coffee until we were almost done with final dessert - too late! Everyone was very nice and friendly, and I don't want to be too harsh. Basically, the service was not equal to the food. Maybe some of the staff is still in training? For example, the girl who brought out half of our food didn't seem to know what was in it - she would put the plates down, mumble something and then quickly moved away. In any case, we will be back - the food was delicious, the staff (including the chef whom we met) were very nice. We can't wait to try (maybe split?) the foie gras burger. They often have what the previous poster described as the perfectly cooked salmon as a benedict for Sunday brunch. My father-in-law, who's an excellent cook himself and extremely picky, made the same comment about the salmon being perfectly cooked when we were there for brunch. Glad more people are dining over at Sweets & Savories! 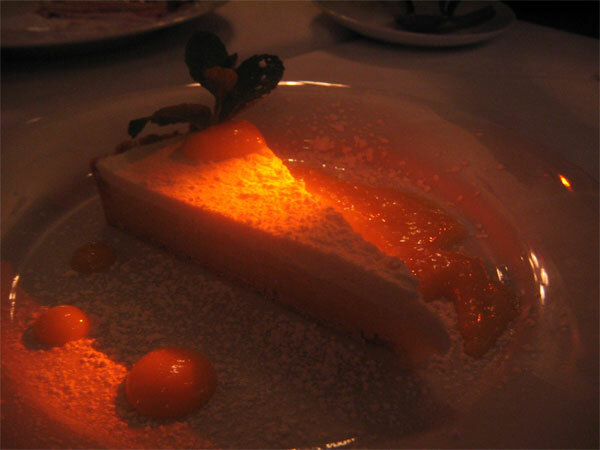 Mr. X and I ventured to Sweets and Savories for a non-Valentine's Day dinner last night. They don't have the a la carte menu on Mondays -- tasting menu only. And because of the holiday, they were running a special prix fixe menu (five courses) for $35 / $55 with wine pairings. We instead opted for the 7-course tasting menu ($50 eacg – a $10 discount from the usual) and a bottle of white burgundy. Course 1: Seared foie gras over roasted pineapple with frisee and a chocolate sauce. 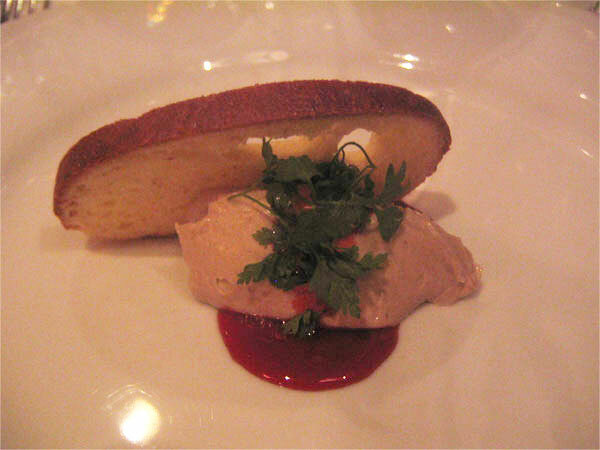 The foie gras was somewhat caramelized on the outside with wonderful creamy inside. Rich, but it all worked. Course 2: Seared scallop with a date/tomato/apricot chutney. The scallop was not as tender as I would have wanted, but the chutney was incredibly tasty. I used some of my bread (an olive oil/sea salt variety) to scoop it up. Course 3: A strawberry risotto. Very tasty! Made with mascarpone, fresh ricotta and a cheese similar to parmesan, creamy and not overly sweet. The contrast of the cool strawberry, warm risotto and crème fraiche topping was delightful. At one point, a server almost gave us another table's risotto. Mr. X said we had already had it -- I was trying to play dumb to get another serving! Course 4: Salmon with a tomato-butter sauce over a root vegetable ratatouille. 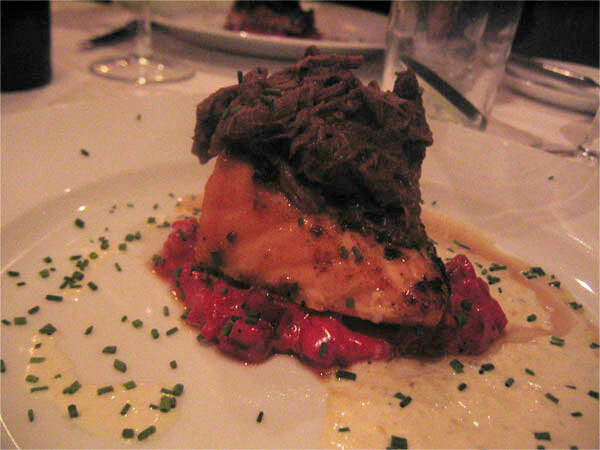 The salmon was perfectly prepared and we loved the tomato-butter sauce. We couldn’t identify the root vegetables (beets, parsnips and carrots were allegedly involved), but they were tasty. I didn’t think the vegetable mixture complemented the salmon that well, but it wasn’t enough for me not to clean the plate. Course 5: Beef filet with foie gras mashed potatoes, potato crisps and a pink peppercorn sauce. It was somewhere between courses 4 and 5 that I finally realized there was a pink/red theme going on. As the great Homer Simpson would say, “D’oh.” Mr. X just laughed at me. (With me?) The beef was perfect, the potatoes decadent, and the pink peppercorns a little too plentiful. 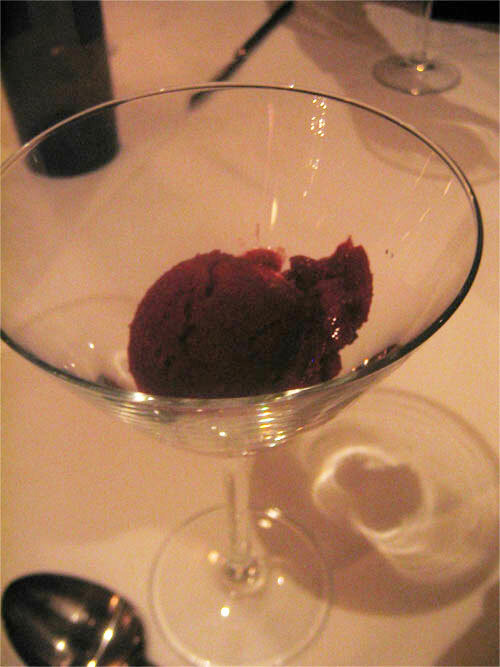 Course 6: Cherry-sake sorbet. The essence of Door County cherries in concentrated, frozen form. In private, I might have tried to get every last drop of this sorbet out of the glass, spoon be damned. I restrained myself in public. Course 7: A raspberry-mousse like scoop came in a dark chocolate heart with pink (!) chocolate shavings, raspberry sauce, chocolate sauce and fresh raspberries. Tasty, yet at that point a touch too rich for me. An unfinished dessert is rare for me. We took home the dark chocolate-amaretto truffles. Mr. X puts this in one of the top 5 meals we’ve had together. The food was incredible, the service mostly efficient. The pacing mostly worked, although there were a couple of times the next course came as we were barely done with the previous course. The new staffers were not as well-versed on the menu. Minute point: but when offering two types of bread, it seems important to describe it completely. The two breads were olive oil/sea salt and fennel/golden raisin bread. One server did not mention the fennel to several tables he offered it to. I don’t really like fennel – I would want to know about the fennel. But I’m nitpicking. We bantered a bit with the staff and the chef as we were leaving. They were preparing for a huge night on Valentine’s Day. We wished them good luck. Thank you once again to the LTH Forum for a great find. * as i was munching on my plump seared scallops, solo, during the valentine meal, a neighboring table, there for the Wed. burger nite, asked if i knew of LTHforum.... LOVE IT! salmon eggs benedict w/ hella spicy potatoes. the French "cafe" was lukewarm, and continued to be lukewarm over the next 3/4 cups during the 2 separate brunches. hated the fact that my pseudo-perfect brunches were continuously ruined by this tepid black liquid... thank you Clarence for hooking all of us up w/ the desserts, it was truly appreciated and, IMO, better than the normal teeth-tingling chocolate truffles. I assume you're referring to Lula Cafe over in Logans Square. I went there years ago. It wasn't bad, but it didn't blow me away. However, I know lots of people here like it. I'm going to Think next Saturday, so can't comment on it yet. I've never been to Schwa. However, I can't say enough about my Sweets and Savories brunching experiences. That's my number one pick of a place to go for my next nicer dinner. It might not be as glam, but the food, service, and price are wonderful. There are a number of postings on this forum, including some posted by me on Sweets & Savories. I was finally able to cross Sweets and Savories off of my "to-do" list and now I've added it to my "to become a regular at" list. Cookie and I enjoyed the seven-course tasting this past friday night (well, six courses plus a sorbet, really) and I was floored by the taste, value, quality, and experitse that was on display. (I was equally floored by the empty tables on a weekend evening). Tomato-saffron fondant with creme fraiche, oranges, frisee, and mint. This first course did exactly what it was supposed to do. It awoke my senses, relaxed, and refreshed me. It had fresh, bright, green flavors and was cool and slightly creamy. The Mantaza's Creek sauvignon blanc was the best pairing of the evening. The next course upped the acidity and the heft with a crab, scallop, and shrimp ceviche, topped with citrus tobiko and poppy seeds. Perfectly textured, high quality, and full of flavor. This course won the award of most creative pairing: a mini mojito in a liqueur glass. I liked starting a dinner on a hot summer evening with two bright, fresh courses. The tastes of fresh vegetables and herbs, lime juice and seafood really wakes you up. The next course was more simple and elegant and the highlight of the evening. A small fillet of pan-roasted Alaskan halibut with heirloom tomatoes, corn butter, and lobster veloute. This dish was simple, fresh, and reminded you about everything you enjoy about summer dining. Part of the reason it worked so well was due to the two preceeding courses. This was a triumph of course progression. The meatiest course was probably my least favorite (but only due to a slight mis-step). The rosemary-grilled pork tenderloin was served at a perfect medium-rare with a comforting home-style corn pudding. It is unfortunate that the dish was dominated by an overly sweet and aggressively acidic pomegranate BBQ sauce (which even obliterated the cabernet that it was paired with). If not for the sauce, this could have been the best course of the night. I did sincerely appreciate how it tasted like a playful twist on a summer picnic BBQ. A very civilized salad course followed the meat. 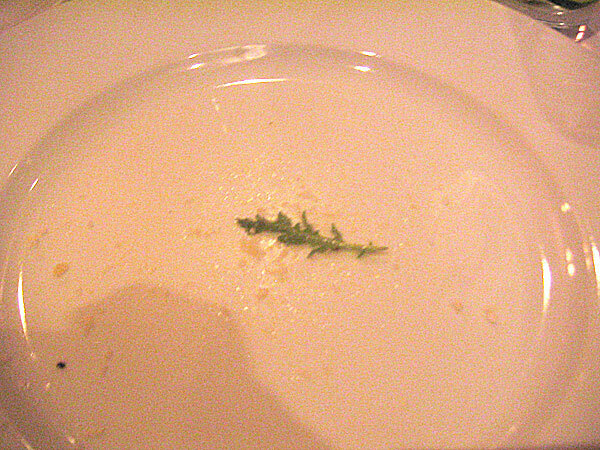 Baby arugula with asparagus and fennel, topped with grana cheese lemon and white truffle oil: Again the chef took strong advantage of the season and dressed excellent ingredients very simply. Our salad was followed by a dark chocolate sorbet which was among the creamiest sorbets that I've ever had. If you would have called it ice cream, I'd have believed you. Simply delicious. (More of an intermezzo than a course, but I'll let it slide). Finally, a wild-blueberry cream soda with vanilla gelato and fresh mint paired with a sweet sparkling moscato. A very enjoyable dessert that may have been slightly over-sized for it's position in the dinner, but it was hard to resist the berries and cream. 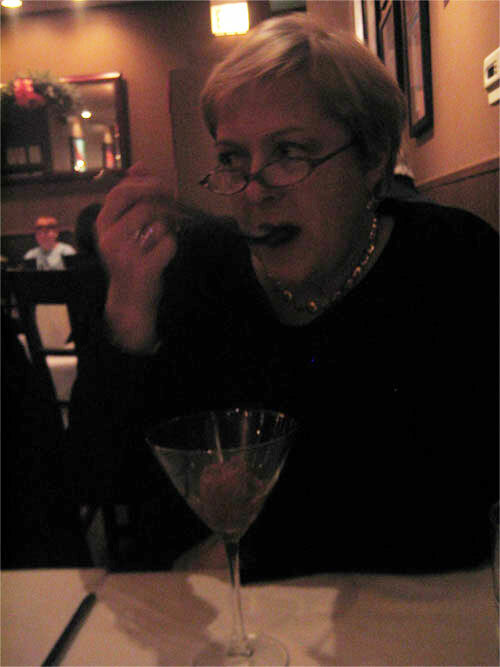 If that wasn't enough, we devoured the rosemary, orange truffles that arrived with the check. Looking back, I was extremely impressed and very pleased. All the dishes were of a very high quality and the progression carried the theme of the season beautifully. If I were to change one thing about the order of courses, I could have done without the one-two punch of the sorbet and cream soda. I would have preferred a fruitier, icier sorbet between the fish and the meat. But that (and the BBQ sauce) hardly detract that Chef Richards has what it takes, and I left very, very happy. The service was stellar: friendly, attentive, and inviting. I really couldn't ask for anything more. At sixty dollars this meal may be one of the most extraordinary values in the city. eatchicago wrote: I was finally able to cross Sweets and Savories off of my "to-do" list and now I've added it to my "to become a regular at" list. I too was at Sweets & Savories Friday night, and thanks to your outstanding report, which I would echo almost entirely, I can generally limit my comments. But let me first note that I agree with you that the tasting menu is really a fantastic value and one of the best deals in town. When we first came in, we sat at the bar for a bit where we sipped drinks and were treated to a wonderful beginning of P.E.I. mussels with grilled smoke sausage and a tomato thyme fume. The mussels and sausage were fantastic and the broth too flavorful not to devour and soak up with some Red Hen bread (I particularly loved the fennel and raisin). My thoughts on the tomato fondant, ceviche and halibut are the same as yours, and likewise for me, the halibut was the star of the show (although the ceviche was a very closed second). As for the pork tenderloin, I could not agree more -- the tenderloin was cooked just perfectly, as tender and flavorful as can be, but the sauce was slightly overpowering. The corn pudding had a fantastic texture, slightly crispy on the outside, creamy yet pillowy in the inside, and lots of whole niblets of corn. We couldn't resist supplementing our tasting menu with foie gras -- sauteed and placed atop perfectly bruleed pineapple with a bittersweet chocolate sauce on the side -- really excellent and pretty simple. Although maybe not the best course, the salad course nonetheless might have been the most surprising course of the evening. At first glance, it appears rather simple, yet the flavors were so vibrant and it was so refreshingly cool on a hot summer night. I'll also echo your comments on the blueberry cream soda and truffles (which were as good as truffles could be). Although like you I might be tempted to criticize a palate cleanser (i.e., the sorbet) being called a "course," in this case I can't imagine having room for another course (but then again, I also shared the mussel/sausage appetizer and the foie gras). All in all, a fantastic evening. What impressed me more than anything was the fact that the chef obviously designed this menu for the heat that was anticipated and delivered on Friday. That is not an easy task to accomplish, and to me, this was one of the more remarkable notes of the evening. Service was friendly, charming and relaxed -- like you're at a close friend's house (in other words, don't go to S&S expecting to find a wait staff trained in the art of perfect posture and overly formal language). The pacing of the meal was a bit rushed for me, but when I asked for them to slow it down a bit, they did so without question or hesitation. As for my take on the lack of crowds: I don't believe that S&S has been reviewed in either the Chicago Tribune or Chicago Magazine -- they really don't know what they're missing, because this is one of the real gems in Chicago. The latest tasting menu sounds great. I'm taking my family (in town visiting from NJ) this coming weekend, so it looks like we're in for a treat. Ceviche w/ lobster, shrimp, a huge scallop, mango, avocado, and citrus tobiko. it was wonderful and a great start. Then snapper on heirloom tomato in lobster sauce. This was really impressive and a great flavor combo. Duck breast with haircot vert over mashed potatoes with blueberry sauce. The duck was a stunner. A fennel salad with orange was simple yet really fresh and flavorful. 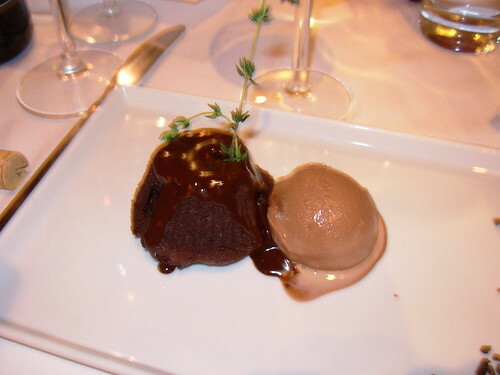 Then a cherry/sake sorbet and finally a chocholate fondant with cocoa ice cream. The truffels at the end were a nice treat. I believe they were rosemary. We had two nice bottles from their reasonable list. One of the things that I think really sets Sweets & Savories apart from other restaurants is the rate at which they change their menu items. Simply compare what you ate last night to what my group ate two weeks ago -- largely different. And now that I know S&S is part of both the Rewards Network and Restaurant.com program, I am likely to dine there more often. Went for burgers last night. Substituted seared foie for the foie pate. Obscene amounts of black truffles shaved over the whole deal. Finished off with black truffle ice cream and black truffle/white truffle truffles. Boy, there are a lot of Sweets and Savories threads on this site, but I'm partial to this one so I'll add a few notes here. petit pois and I had the pleasure of the company of Mr. & Mrs. InLoganSquare for dinner at Sweets and Savories last night. We opted for the tasting menu as opposed to the $10 burger special. Usually, I'd look at a list of things like that and the cynic in me thinks of a restaurant that's trying too hard to impress, pumping itself and it's prices up with luxury items and gimmicks. Nothing could be further from the truth at Sweets and Savories. An astounding meal that topped my expectations and my prior experience there. The highlight course for me, which may be one of the best things that I've eaten all year, was our second course: Curried vichyssoise with creme fraiche and citrus caviar. Served at the perfect temperature with the perfect amount of creme, caviar, and chive garnish, this soup was luxurious and flavorful, clearly showing the skill of the chef and the quality of the ingredients. Oh yeah, and Paul the waiter was terrific. eatchicago wrote: An astounding meal that topped my expectations and my prior experience there. Mrs. JiLS and I heartily concur. As eatchicago pointed out last night, S&S is one of those great little neighborhood places putting out a just-below 4-star meal in a casual setting that litters New York City, but of which there are only a handful (maybe 20) in Chicago. The notion that you can just drop into a little spot and be served such an amazing menu, with no muss, no fuss, no valet parking or downtown attitude; well, it is a little miracle. eatchicago wrote: The highlight course for me, which may be one of the best things that I've eaten all year, was our second course: Curried vichyssoise with creme fraiche and citrus caviar. I concur. Funny, this plus that corn and pepper soup I got at Fonda del Mar back in January are currently filling two of my top-10 for 2006 slots. Is soup the new black? Don't know, but I've been finding much greater attention to it than in the past. Heck, even Sabatino's is getting more experimental with its soups these days. Good news, I say. 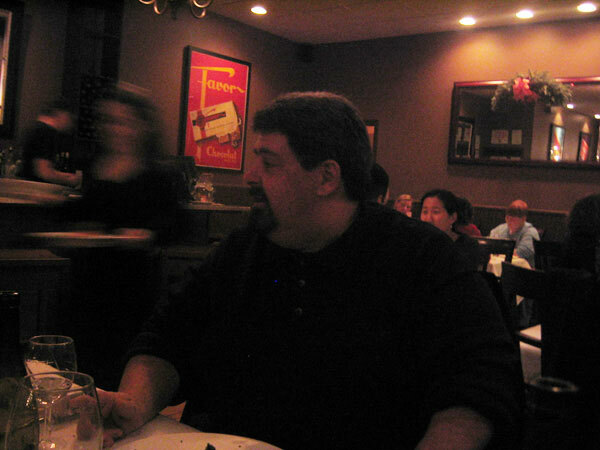 eatchicago wrote: Oh yeah, and Paul the waiter was terrific. Yes, that he was. 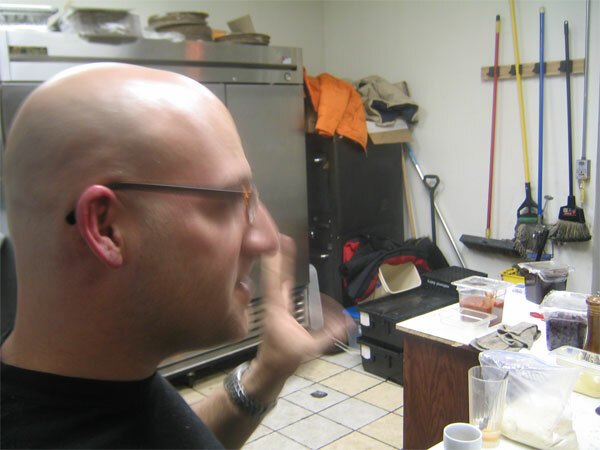 Paul (a/k/a "The Bald Guy") is a real professional. Yes, he has a forceful personality, and yes, he does tend to "take charge" of your meal ... that is, assuming you go for the tasting menu. (Worth noting is that he didn't try to push the tasting at all, in fact, his initial approach was to assume we were there for the Wednesday kobe burger discount ... although his eyes lit up and his demeanor switched into "full on" mode when we said that no, we wanted the tasting menu.) I think Paul is just a guy who takes what he does very seriously, knows what he is talking about, and wants to make recommendations that his diners will enjoy ... even if they don't know it in advance. But he isn't overbearing at all, which seems to be a complaint of some. The one thing I think S&S could really do to up the ante with its tasting menus would be to include paired wines. As it is, they have very few wines by the glass, but an excellent short list of bottles (including a Turley Zin that we relished last night, by the way). We ordered a white Bordeaux along with that zin, and both were great wines ... but they weren't always the best match for the various courses. To his credit, Paul offered us glasses of Sauternes with the "Gourmet Duck Liver" course (which we turned down, having already ordered two bottles of wine). I know for a small place, this can be a problem with unfinished bottles. Anyway, just a thought on how to make an incremental improvement in an otherwise fabulous restaurant. JimInLoganSquare wrote: The one thing I think S&S could really do to up the ante with its tasting menus would be to include paired wines. My first visit to S&S for the tasting menu did include a wine pairing option for an extra $35. Paul chose the pairings himself and did a pretty nice job. I have a feeling that pairings are offered based on wine availability, Paul's mood, the phase of the moon, etc. The highlight course for me, which may be one of the best things that I've eaten all year, was our second course: Curried vichyssoise with creme fraiche and citrus caviar. Visited for the first time a couple weeks ago and has the vichyssoise for brunch, it was lovely. I also had the breakfast risotto - beautifully prepared with thick cut pieces of bacon and a gorgeous egg poured out of the shell tableside. Yum! I am not a big breakfast person, but I would eat breakfast risotto for any meal of the day. eatchicago wrote: My first visit to S&S for the tasting menu did include a wine pairing option for an extra $35. Paul chose the pairings himself and did a pretty nice job. I have a feeling that pairings are offered based on wine availability, Paul's mood, the phase of the moon, etc. Similarly for me. Although I'd had the vision to ask Paul for a written list of our courses, by the time my nephew and I rolled out of S&S, I'd unfortunately lost the, um, focus to discern that the transcribed menu omitted names of the accompanying wines. FWIW, the Foie Gras on Pineapple Brulee came with a Sauterne, the Alaskan Halibut had a Michael Sullberg Chardonnay, the Seafood Ceviche paired with a Michael Sullberg Fume' Blanc, a Grilled Beef Tenderloin was with a Bordeaux, and Blueberry Risotto with Duck Confit came with...some non-French red--perhaps a merlot (or maybe a pinot noir?) Sorry for the fuzzy report; I realize that Enquiring Minds Want to Know. * I can assure you that we felt the pairings well-complemented the courses and provide quite good value overall. I have been to Sweet and Savories before. It was when it had been relatively new, and the buzz was around it's Kobe/foie burger and duck fat frites. I went but didn't really think it was outstanding. Granted, I think I was fighting off being sick (and won the battle! Unfortunately the bf was a casualty and stayed home) so maybe my taste buds were not fully activated. Whatever the reason, when I went for a second time, this time for an early dinner and the bf was attended. I was blown away. When I had visited it for the first time, it had been a mid-evening meal and the place had been busy. When I went on Sunday for a 5:15 dinner before a movie, the place was empty. Only two tables were occupied (another couple and us), though when we left a bit before 7pm people were starting to come in and it was looking 1/3 full. I was greedy and ordered enough for my light dinner and a leftover for a future dinner. The waiters gave us our privacy to chat in "our half of the room" from the other couple and enjoy our meal almost like we were alone, but if we were looking for our dishes to be cleared, dessert menu, or check, he was always there without having to actually wave him over. First, I started with the lobster risotto with truffle oil. How could I resist, and of course it was to die for- risotto, huge chunks of lobster, and truffle. I wiped that bowl clean with my bread. Other starters included the refreshing Tomato Saffron Fondant with creme fraiche, orange supremes, baby frisee and mint, where it was opined (I didn't actually try this one since the bf was already limiting himself to dinner of this fondant and two soups) that it would have been tastier with more oranges. Also good were the Curried Potato Soup with creme fraiche (the cirus tobiko caviar were requested to be left out) and the Tomato Bread Soup with basil and Estate olive oil. Wish I had a chance to try that soup with the tobiko caviar though it was still better then either of the two tomato dishes on its own. The main entree was an incredibly tender and flavorful Rosemary Grilled Pork Tenderloin with pomegranate BBQ sauce and really thick, stick to your ribs corn pudding. The duck fat frites came with sweetly tart fig ketchup and smelled and tasted heavenly. Dessert was also out of this world with the trio of gelatos we had: orange chardonnay, cherry sake, and blueberry cabernet. The raspberry cream soda with the Tahitian Vanilla Gelato scoop, soft whipped cream, and sparkling water was good but I didn't think it was all together: the raspberries floating in the dessert were tart and fresh but didn't add much flavor to the beverage itself, so the parts were never brought into a whole. Those gelatos were unbelievably bursting with yummyness and despite my heavy meal (um, risotto, ALL the fries by myself, and 1/3 of the pork tenderloin) after that refresher I felt like my meal was not too rich. Or I'll keep telling myself that. I must go again with someone who won't guilt me if I want foie gras, but no... somehow this lover of duck fat frites is with a vegetarian Jack Spratt. Just a brief note to remind folks that S&S rocks on. Mrs. JiLS and I had a most enjoyable dinner Saturday night, as prelude to strolling over to see a riot in a theater called B.I.K.E. at Facets. * Charcuterie plate held some delights, if no surprises, and I'll admit I kept thinking about the antipasti plate at Sabatino's (three times as big, 2/3 the price, exactly the same quality), but still worth the asking price of $12 (and including an extraordinarily creamy and smooth country pate). Kobe burger? Perfection. Mrs. JiLS is still talking about it 24 hours later. Duck fat frites? Very close to perfection. Enough has been said about this by others. Tomato bread soup? Very good, a bit simplistic flavor profile (just tomato and a somewhat harsh dose of basil), but served at the right temperature and certainly not BAD, just not one I'd repeat. The highlight, though, was my entree, "brasied [sic]" short ribs, served with saffron(!) grits. Wish I'd asked for an extra side of grits; the grits, as they say, was GOOD. As was the perfectly tender beef, by the way. I highly recommend this dish; worth the trip for this alone. Dessert was a forgettable caramel bread pudding that was, oddly, like a bread pudding prepared on the plate, if that makes sense. Just not right. Ah, well. The ribs and the grits and the burger and the frites were more than adequate compensation. They also mixed a rather appealing Manhattan, although I have to voice a complaint about the ridiculous markup on the wine -- LAN Rioja at about $30, that retails (at least at Costco) for about $8 or $9; not a bad wine, but come on, guys, with the price. Though the above appears a bit patchy-looking, allow me to sum up by stating that the sum exceeded the parts, this was a very enjoyable meal, certainly one of the best we've had in several weeks and a match for the tasting menu we enjoyed a few months back with eatchicago and Cookie. And while not cheap, the price was reasonable for the experience, about $120 for the two of us, with wine and (one shared) cocktail. As Mrs. JiLS noted during the meal, S&S is just that sort of small but accomplished, urbane small house that makes you understand, after a while, just why it's better to live in a city like Chicago, than in (say) Syracuse, NY, where there may be one or two spots capable of a meal like this, but only that. There's just something about knowing that this is just one neighborhood spot, there is real competition, and I couldn't realistically try all of them, as hard as I may attempt to do so. That feeling of, ahhh, yes ... but where next? Sweets & Savories makes me happy I live in Chicago. Although I cannot go on at the length that S&S deserves (for which some might be grateful), I, too, was amazed by the skills of the kitchen. We went on a Monday, and so the ultra-inexpensive tasting menu, normally $60, was an insanely inexpensive $50 and corkage was free. This is the best high-end dining bargain in Chicago, and the food was creative, beautifully prepared, well-presented. Perhaps it lacked some of the touches and subtle vision of Schwa - and of Trotters - but as I left I thought about when I could return again. Chef Richards is amazing in that he produces such cuisine without a huge kitchen crew, and Paul is a host to be reckoned with. If every restaurant were this good, home cooking would become a lost art. 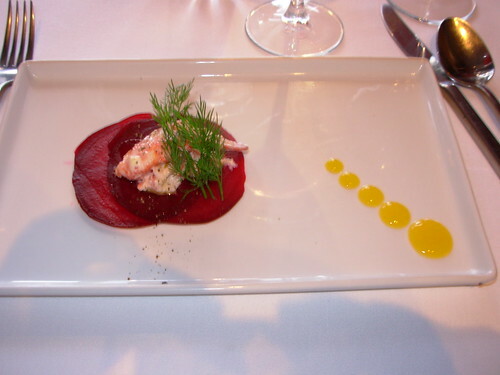 1) Beet Capaccio with Poached Lobster, dill and mango coulis. 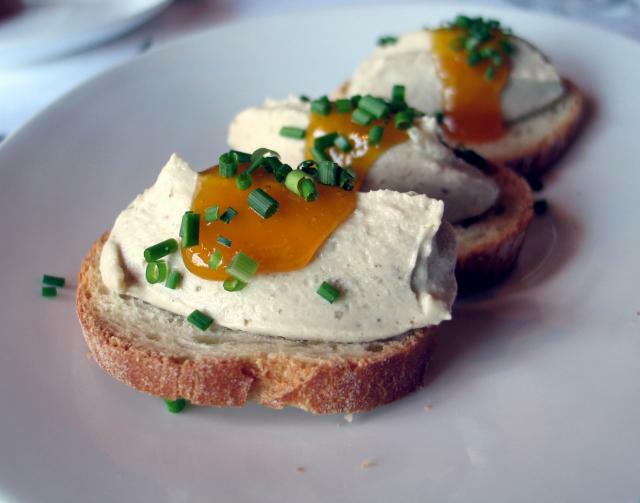 One of the best, lush appetizers of the year. 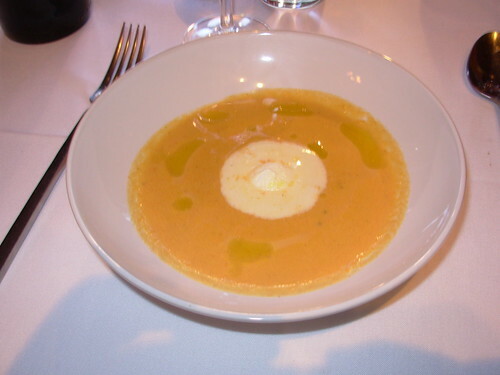 2) A very rich, straight-forward Carrot-Ginger Soup with Seville Orange Creme Fraiche and Olive Oil. The olive oil and orange creme fraiche added zing to a beautifully made, if standard, preparation. 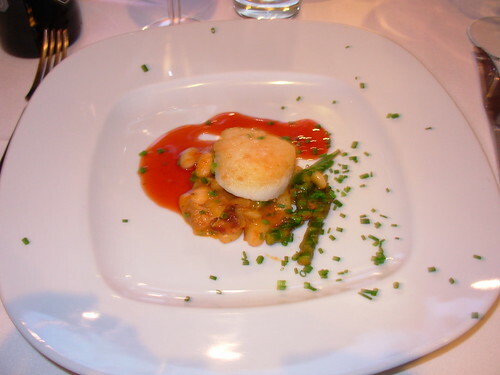 3) Scallop and Bean Ragout with Asparagus and Bacon, served with Pomergranate BBQ Sauce. Perhaps too many clashing tastes, but a creative dish. 4) Leg of Lamb with Potato Puree with Grainy Mustard Gastique (no photo). Simple, but very good. 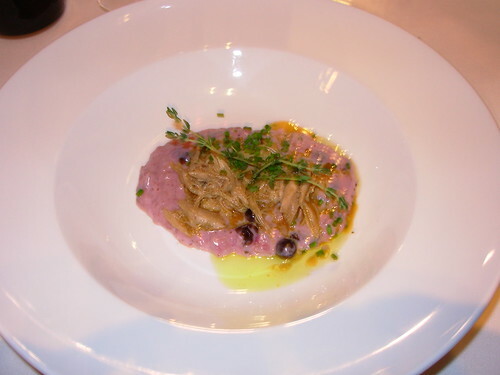 5) Blueberry Risotto with thyme and duck confit. A lovely dish and very brave with the mix of rice and blueberry. 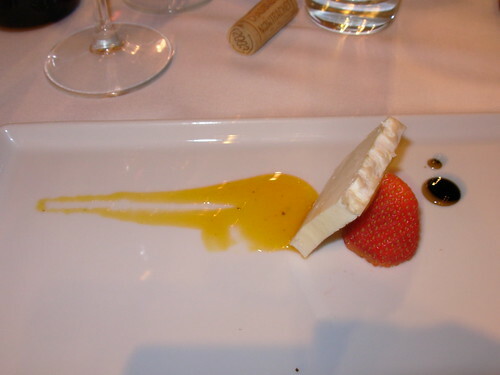 6) An elegantly presented strawberry and slice of camembert with mandarin orange puree and black mission fig gastrique. 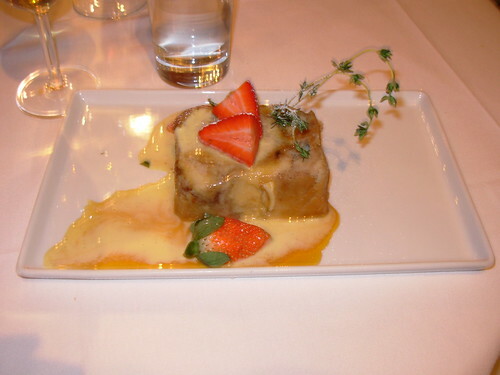 7) Sticky bread pudding with Creme Anglaise, Thyme (the herb of the night), and Strawberry. A little too heavy and bready for my taste. 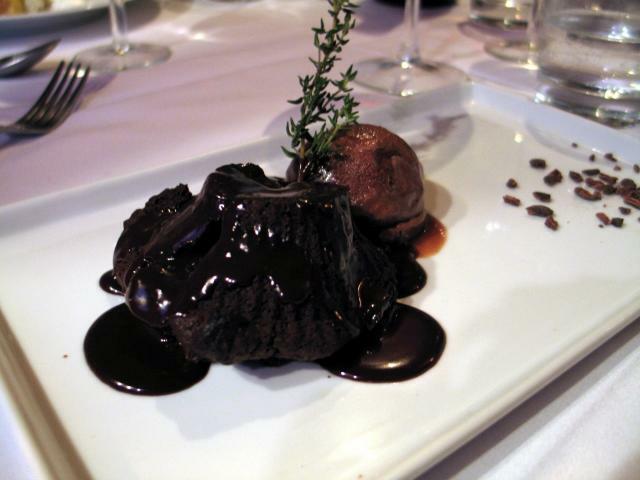 8 ) Warm chocolate fondant and chocolate sorbert. Both suitably prepared. Given the price, that this high quality dinner that can be compared with any restaurant in town is remarkable. Best meal of the year, perhaps not quite, but within the realm of new American cuisine, there is no competition for the best value. Sweets and Savories is where to be. 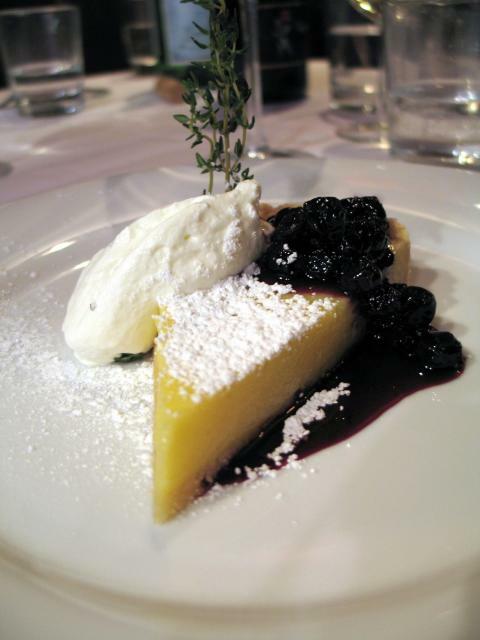 As great as Sweets and Savories is, on Mondays -- with the tasting menu priced at a mere $50 -- it's simply amazing. A couple of Mondays ago, I walked in at about 5:30 and Paul immediately warned me that because it was Monday night, it was 'Chef's Choice' only. As I told him, that's why I come to Sweets and Savories and even though it had been far too long since my last meal there, I knew I could count on an outstading meal and an exceptional value. This experience was especially fun because I had with me 2 folks who'd never before been to S&S's. One of these guys is very old skool and will readily admit that he's somewhat difficult to please. I think that their general perspective before our meal was a mix of skepticism and doubt. But, by the time we'd finished our 4th course, they were raving about the food and proclaiming that the meal would have been a tremendous value, even if it had ended right then. But I don't mean to get ahead of myself. Our first course was a delicious and rich one-biter, Foie Gras Mousseline with seville orange gelee. I loved the creaminess of the foie mousseline and even though I'm not usually a huge fan of seville oranges, the sharp aroma of the gelee complemented the mousseline nicely. A great start. Next up were Prince Edward Island Mussels in an herbacious tomato lobster cream. 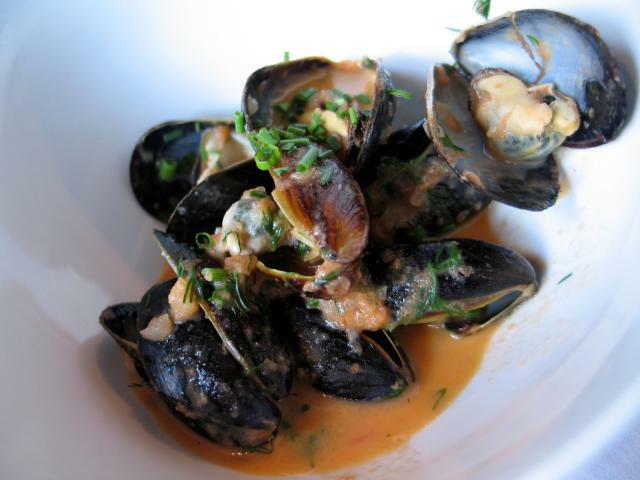 Chef Richards is consistently masterful with mussels. Each time I've had them at Sweets and Savories they've been delightful and this instance was no exception. Not only were the mussels tender and fresh but the accompanying sauce was so good, I was eating it with a spoon after the mussels were gone. 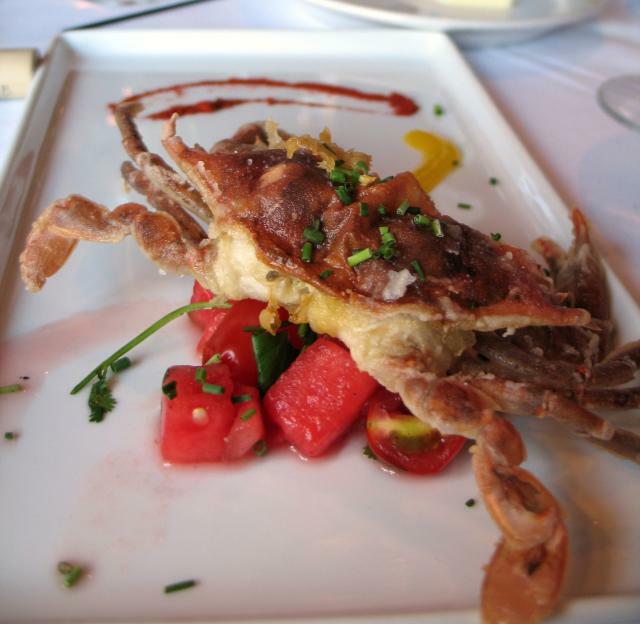 While we chatted before the meal, Paul excitedly mentioned that Sweets and Savories had the very first soft-shell crabs of the season, in the entire city. He explained that this was actually because they'd gone out of their way to pre-order them, months back. Course 3 featured these wonderfully fresh creatures, sauteed to crispy perfection and served with watermelon-tomato salad, mango coulis and smoked Spanish paprika. This was possibly the best soft-shell crab I've ever eaten. It was piping hot and the texture was immaculate; delicately crispy on the outside and remarkably tender inside. 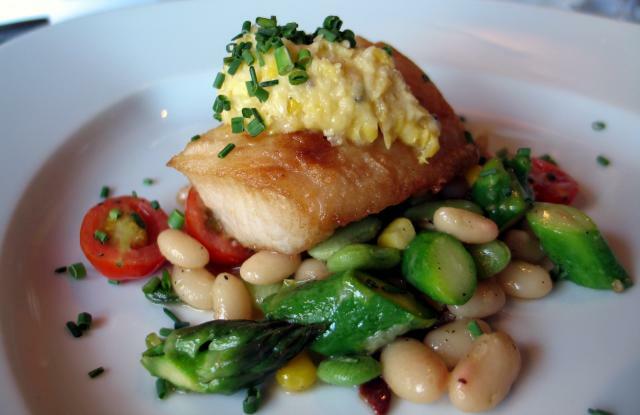 Next up was a perfectly-cooked section of moist and fresh pan-roasted Sable served atop a white bean, fresh fava and spring vegetable ragout with bacon and topped with roasted corn butter. This dish was amazing. The sable was remarkably tender and it went so well with the spring vegetable ragout. The smokey note, provided by the bacon, was right on time and tied everything together. The ornate dollup of roasted-corn butter atop the sable was glorious and delicious excess. In this case, atop actually meant 'over the top.' Again, after this course, my hard-to-please friends were basically in awe. One mentioned that if the meal ended right then, it would still be an incredible value. The other said that if it cost twice as much, he'd still be impressed. He also mentioned that there are very few restaurants to which he'd go back but that he already knew that Sweets and Savories was one of them. A delectable foie gras risotto with dry fig and fig-must was next. I loved the rich intensity of the risotto, which was, again, perfect. At first, the whole, dried fig made me a bit nervous but it was a great accent to the intense risotto and the fig's dense, chewy texture and tiny, crunchy seeds were perfect with the creamy risotto. The next dish, grilled venison strip-loin with brasied french green lentils, black cherry chutney, veal demiglace and truffle oil, was delicious too. Here again, the components worked in unison to make the dish special. I loved the rare venison and thought that the lentils were a perfect base for it. I couldn't recall ever having this well-suited combination before. 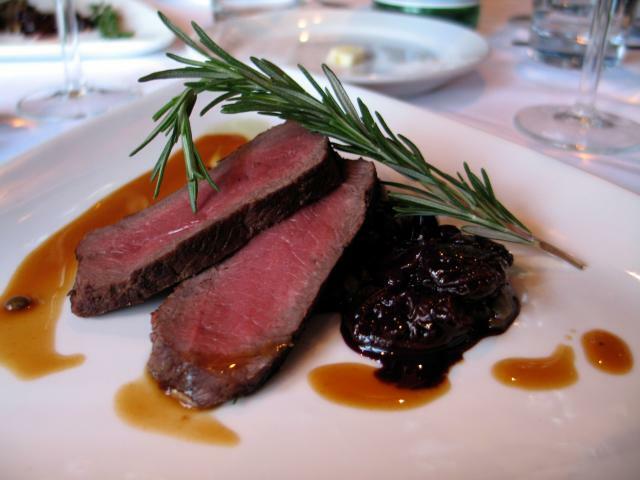 The aromatic and tart black cherry chutney foiled the rich venison very nicely. A great dish. A refreshing salad of roasted heirloom garnet beet, Indiana goat cheese, baby frisee and broken vinaigrette finished up the savory progression very well. I love beets and these were exceptional. The goat cheese complemented them very well. 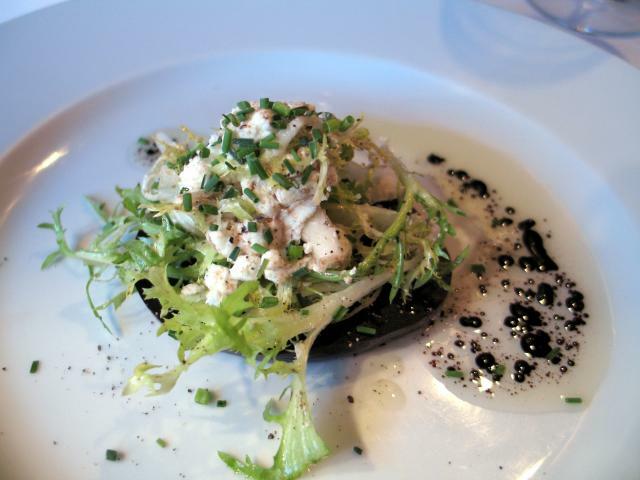 The fresh baby frisee added a wonderful crunch and the broken vinaigrette provided a perfect amount of acidity. 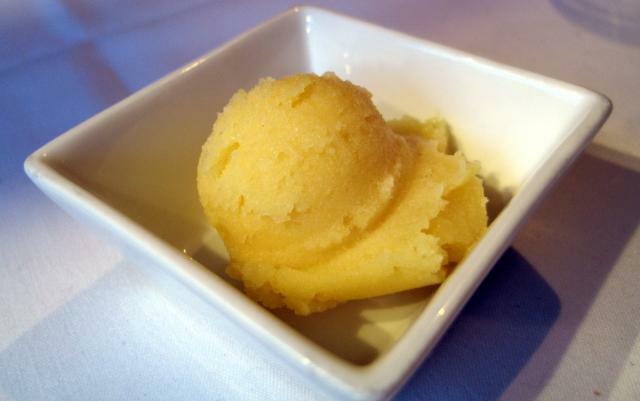 I loved the refreshing Pineapple and Spiced Rum sorbet which was a great intermezzo between the 2 sides of our meal. And the 3 desserts we tried after that were each excellent in their own right. 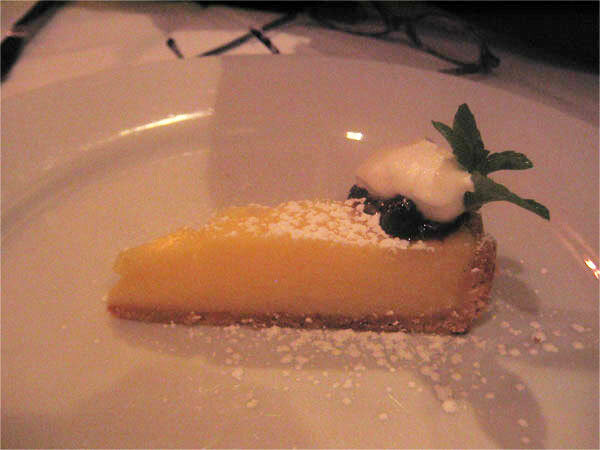 My favorite was the Meyer lemon curd tart with blueberry compote and soft whipped cream. The curd was perfectly acidic but also sweet and not too eggy. The shell was buttery with a perfect texture. 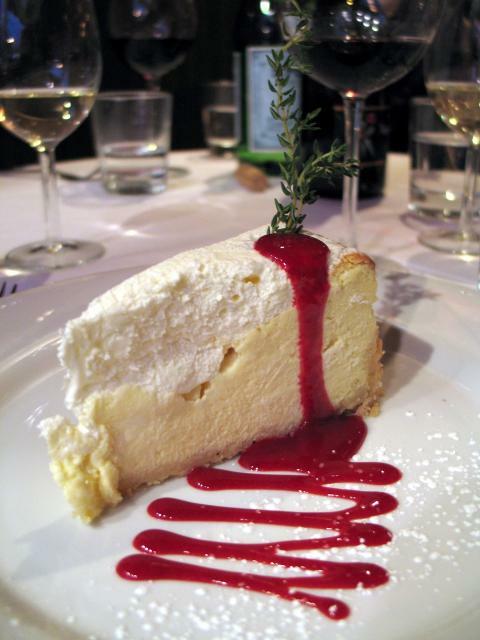 The rich, creamy Lemoncello cheesecake with raspberry coulis was also great as was the warm dark chocolate fondant cake with chocolate genache sauce and cocoa-cinnamon sorbet. I loved this dish because I actually needed some chocolate at this stage of the meal and the sorbet was reminiscent of Mexican-style chocolate ice cream, which is one of my favorites. This was another fantastic meal at Sweets and Savories; probably my favorite in about a half-dozen visits. Even though I personally was not at all surprised by its extraordinary quality or the great value it represented, I was still blown away by it. Of course, my friends were still raving about it days later. It made a lasting impression on them. At $50, there is almost nothing else in Chicago that even comes close to matching up with it. 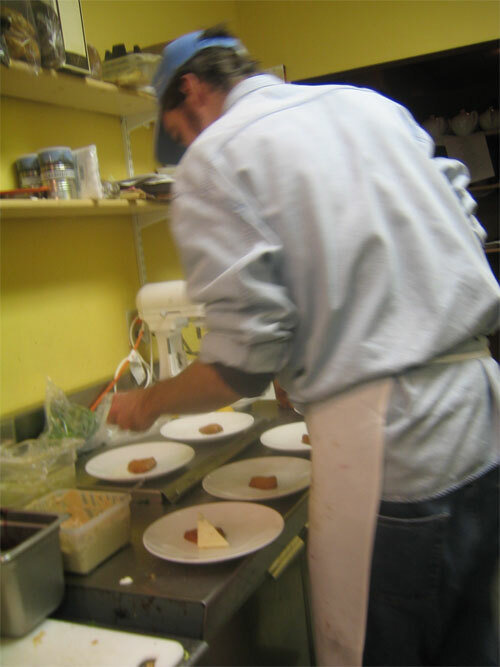 The dishes being turned out by chef Richards are world-class stunners which never fail to satisfy. Is there any other chef in Chicago who can match his mastery over luxury ingredients? Maybe so, but none of them come close to hitting this price point. Sweets and Savories is continually producing phenomenal food and always tailoring their menu to take advantage of what's in season. By any measure its one of Chicago's most important restaurants and for the budget-conscious it's an exceptional restaurant that in a very genuine sense, cannot be matched. Last edited by ronnie_suburban on May 3rd, 2007, 9:22 am, edited 1 time in total. Let me add my two cents - after casting about for an Easter brunch location, we discovered on a second call that S&S was offering one. The first call, they denied it, but I suspect they got enough calls to change their minds. Brunch is not a favorite meal, and while it is a family tradition to go out for an Easter brunch, originally hosted by my 100 year-old aunt but she no longer joins us, there have been a lot more misses than hits. The Swissotel, and Drake were mob scenes and unimpressive; the Four Seasons was much better and I would go back; Le Francais in its Lachowicz period was okay, but not terribly exciting; North Pond Cafe was pretty good, and S & S was very good. Let me explain very good - it consisted of some nice baked goods, a lovely, fresh tomato soup, a Bloody Mary made of fresh-squeezed tomato juice (clearly David had come by some good tomatos that day and he was going to use them) and one dish that, though simple enough that I will try it at home was perfect, a veritable aha moment, slap my head, why didn't I think of this before. The dish was bacon and egg risotto. Creamy, lightly seasoned risotto, with flecks of perfectly crisped "bacon," more like pork belly heaven to me, topped by a very soft boiled egg sitting happily upright in its shell, the top removed. Add a touch of theater - flip the egg, pour it out, mix as much as you want, and indulge in the triply smooth creaminess of egg, risotto, and the combination with the wonderful touch of salty pork. Sensual, delightful, the dish bespoke a breakfast in Venice in the sunshine by the canal (add a tiny shave of truffle to make it completely decadent, I think). And like all great inspirations, once revealed, it seemed so obvious, so right. Thanks for the specific Easter post. We were also pleased to get an Easter reservation there. Unfortunately, a change in plans prevented me from partaking in the fabulous risotto. It's been over a year since my lips have grazed the breakfast risotto that's just every bit as lovely as you described. Really, one of the best city brunches and that risotto holds its own. Once my husband and I discovered the great brunch offered at such reasonable prices, we visited repeatedly, until my husband burned out. I've gotta get back there quick!